I wish I had come up with this recipe myself, but I did not. It came from Better Homes and Gardens, whose recipes I really love because they are simple and do not require tons of complicated ingredients. Ain’t nobody got time for that! My cousins were coming up for a quick lunch visit a few weekends ago, so we made this recipe because it was easy to make ahead and throw in the fridge. It’s also not too heavy of a dish, particularly for the summertime. It’s filling, but refreshing. The spicy arugula is great with the pesto. You could turn this into a more balanced meal (although there’s already protein in the beans, and even more if you used a pasta like Barilla Plus) by adding some soy chick’n strips to it – I might do that the next time I make it. 1) Prepare pasta according to directions. Drain, rinse, and set aside. 2) In a large bowl stir together pesto, vinegar, and salt. 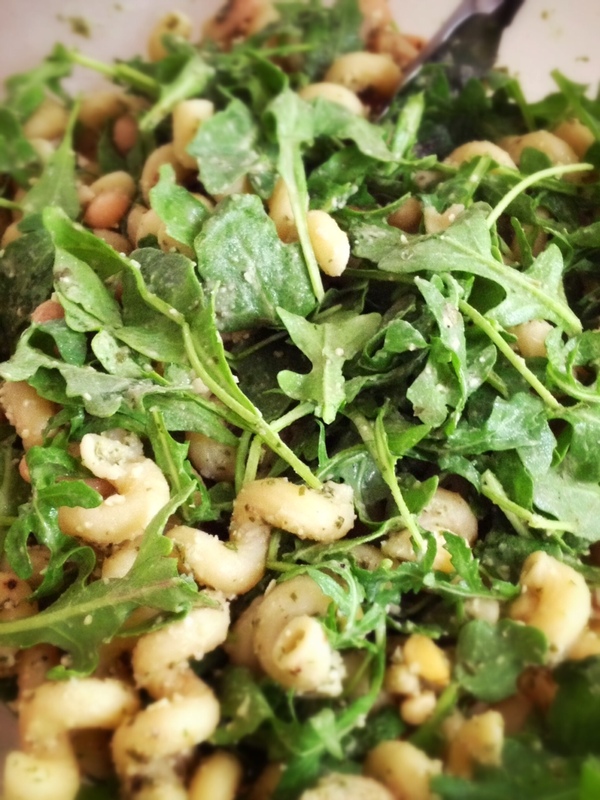 Add beans, cooked macaroni, arugula, and half of the pine nuts. Toss well. Serve at once or cover and chill up to 6 hours. Top with remaining pine nuts and grated cheese, if desired. Go Veggie isn’t vegan, I’m afraid. It contains milk. The product that I mentioned is, but you are right – as a brand, they aren’t completely vegan.